Love stamping on a small space and getting the shape, the color ,and the sentiment to work together. Stamps: Clear and Simple Stamps Writer's Desk and Lawn Fawn Harold's ABCs. 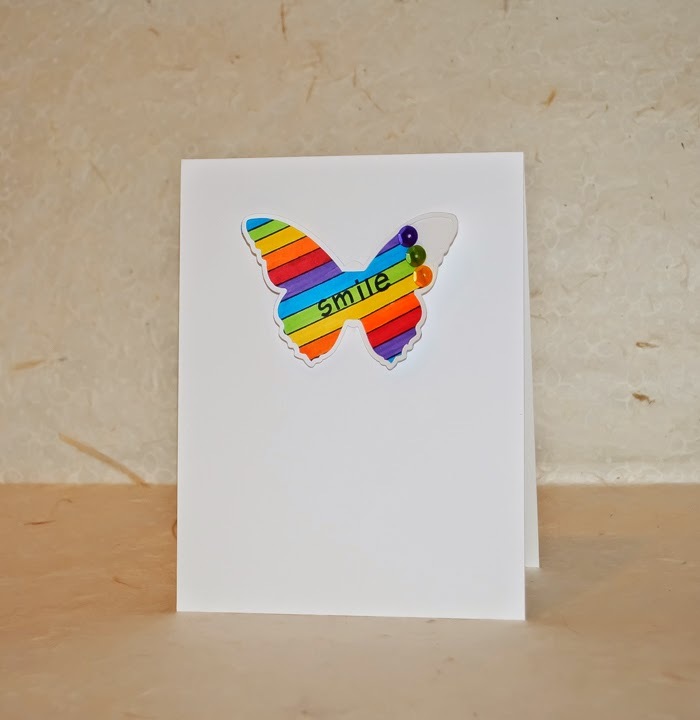 Butterfly cut with the Silhouette and colored with a Copic rainbow. Cut a bunch of these butterflies, so they may be popping up now and then. Fabulous! Love the three sequins! Very well done~love all of your card. A great card - so colorful. What a lovely card Joan. I love that you added the word Smile onto the butterfly. Fun, and a fab design! I really love the way you didn't carry the colour all the way across the wings but left one edge blank and added the sequins.